CSA shareholders receive a portion of the farm's harvest weekly from mid June through October. 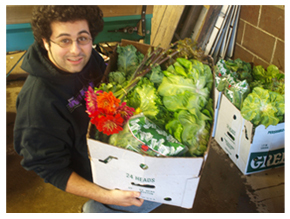 Members receive the freshest, highest quality produce available at near wholesale cost. Fresh locally grown vegetables, harvested at their peak of nutritional value. Each growing season brings unique challenges. Occasionally a crop may fail due to conditions beyond our control. Our goal is to provide you with abundance throughout the growing season by growing a variety of produce. Seasonality affects the size of your share. We grow a great diversity of vegetables. Following is an example of what to expect. June/July: leaf lettuce, romaine hearts, rhubarb, kale, beets, parsley, summer squash, and zucchini. We also plan to supplement the June shares with flowers from our greenhouses. August/September: all of the above plus peppers (sweet and hot), eggplant, tomatoes, cucumbers, sweet corn, melons, carrots, and okra. October: we typically lose all the fruiting vegetables but still have lettuce, kale, beets, parsley, winter squash, leeks. In October, we plan to supplement the weekly shares with hardy mums, corn stalks, and pumpkins. As time and the weather permits, we will try to add to this mix. Our current plan also includes some cut flowers each week as the season progresses. **If you prefer print & fill out the pdf application and mail it back to us or stop by the greenhouse and join.